I sincerely apologize for the three-week hiatus. I can’t even use the excuse that nothing exciting has happened—it’s more like there’s been too much excitement and not enough time. My summer is officially in full swing, and it’s been a busy few weeks of working, training, and spending time with family. But last week, I put all of that on hold while I was away in Lake Geneva at One Step at a Time camp. 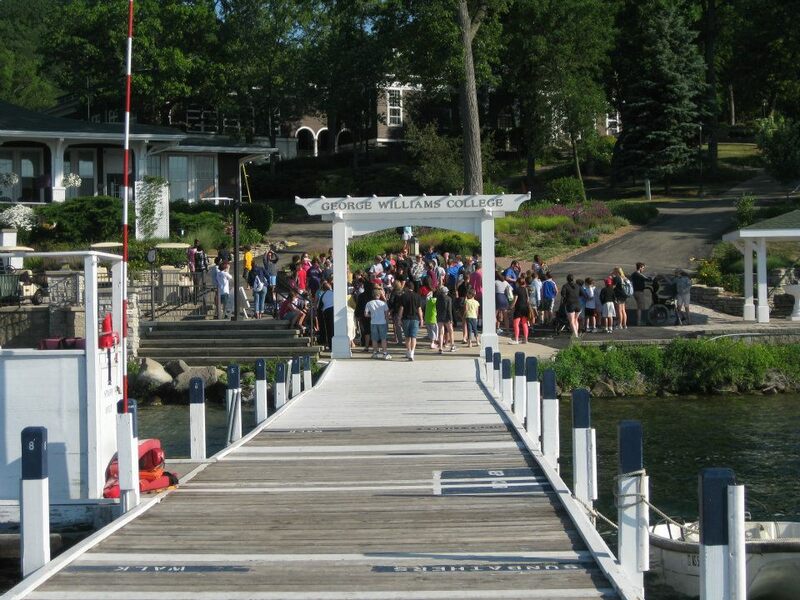 I wrote about camp last month (see “The Happiest Place on Earth”) but in case you missed it, it’s a camp for kids with cancer that I’ve been going to every summer since I was 13. One Step at a Time serves kids ages 7-19, and is divided into seven different programs based on age. This year, I was a counselor in Stepping Up, the program for 11 and 12-year olds. While I would never volunteer to hang out with middle-schoolers in the real world, in the cancer world, this age group rocks. I like them because they’re not yet too cool for school, and they still think that we counselors are fun to hang out with. But they’re also old enough to understand sarcasm, have a real conversation, and get through the week without being reminded to shower. This age group is also awesome because it’s really easy to get them excited about two of my life passions: camp songs and circle games. All you really have to do to get them pumped about something is turn it into a contest. Given how competitive I get about trivial things, I naturally appreciate kids who are also driven by competition. 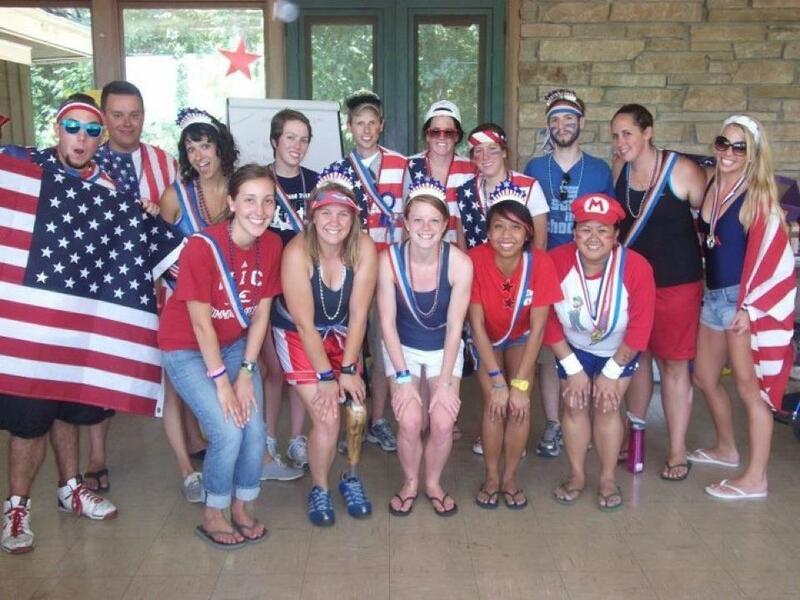 Coincidentally, the theme in Stepping Up this year was “Olympics,” which was really just an excuse for our program leaders to wear sashes everywhere they went and call us winners all week. Needless to say, the kids loved it. In actuality, the two Stepping Up leaders really were winners, and led a super smooth week. We spent our mornings rotating between activities like sports and games, dance, fishing, and arts and crafts. Our afternoons were spent down at the waterfront, swimming, boating, and eating obscene amounts of ice cream. Dinner was always followed by an all-group activity, like an Olympic decathlon, a real life game of Clue, a campfire, or a dance. In between, we spent every meal singing camp songs and cheering about which program had the most spirit. As you can see, it is structured just like any other camp, but I think that’s what makes One Step so special. We don’t baby the campers, make them talk about their feelings, or treat them differently because of their illness. And that is exactly how they want it. When you’re in middle school, you spend every waking moment trying to fit in; but when you have cancer, “normal” is the last thing you feel. One Step gives its campers a simple gift—one week out of the year where they are able to feel normal again. But I believe that for a kid with cancer, this is the greatest gift in the world. This is what a parade winner looks like. One of the highlights of the week was the One Step parade. Every program was given a 3’x5’ trailer bed and was told to design a float that they would march with in an all-camp parade. Now as I alluded to earlier, our kids were very much motivated by competition, and we counselors milked this for all it was worth. We told them that we were in this to win it, and were then amazed by how they all came together to build the greatest float ever. We decided to make the float Olympic themed to go along with the theme for the week. We constructed an Olympic torch and a replica of Big Ben to put on the float. I got to relive my high school homecoming float-making days as I taught all the kids how to make tissue paper rosettes. 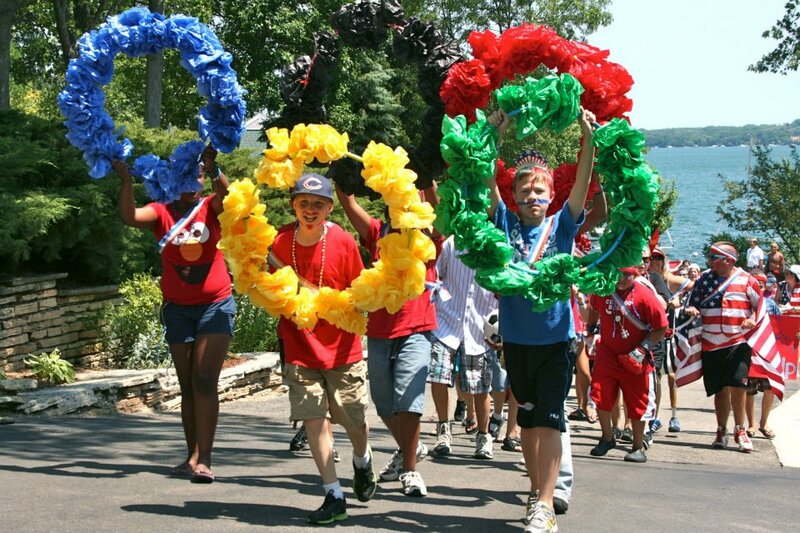 We ended up tying them around 5 hula hoops in order to make the Olympic rings. While the float itself was pretty cool, the best part was the action that followed it. Behind the float we had a color guard, campers dressed as athletes, kids carrying flags from different countries, and dozens of Team USA banners. All the while, we sang original cheers that the creatively inclined campers had written. I really wish I could have watched us marching through campus, but I’m confident that it could have given Macy’s a run for its money. At one point on the parade route, I turned around and looked at all of our kids decked out in patriotic attire, chanting “USA!” and smiling ear to ear; and I can honestly say that I’ve never been more proud of a group of 11 and 12-year olds. In case you were wondering, we ended up wining the grand prize. Bam. Throughout the week, I caught myself laughing to the point where I couldn’t breathe. Like when the counselors of Stepping Up created an elaborate flow chart illustrating all of our dates to the dance. Or when my friend Andrew fulfilled one of my life dreams by serenading me on top of a piano with a song he wrote called “Hailey had a Little Leg.” Or when we forced our campers into a “clean room competition,” which prompted them to scrub the living daylights out of their rooms and then greet the judges with fresh towels and honey roasted cashews. While I spent most of camp laughing, I also found myself being moved to tears at random moments that took even me by surprise. Like when my adorable camper who had been covering her head all week finally decided to ditch her hat, and told me that this was the first time in two years that she felt comfortable going in public without one. Or when a group of 9-year old girls got up in front of the entire cafeteria and sang “What Makes You Beautiful” to their favorite counselor while she was on chemo. Or when a brain tumor survivor announced to the rest of camp that she had finally passed her swim test after 10 years of trying. Or when a 12-year old camper who is the size of a kid half her age sat down with her guitar and stunned the rest of camp with the size of her voice. You would think that after coming to this place for the last 8 years, I had seen it all. But year after year, the people of One Step continue to inspire me, motivate me, and move me by reminding me what life is all about. I’ve known for a long time that One Step changes lives. But as I’ve gotten older and heard more and more stories, I have realized that camp also has the potential to save lives. It does this by providing treatment that even the most advanced drug or brilliant doctor are incapable of delivering. It saves lives by showing those who are sick that life is worth fighting for, and that having cancer can be a beautiful thing. It gives us a place to discover who we really are and gives us the confidence to go through with becoming the people we were meant to be. Simply put, camp teaches all of us to become better versions of ourselves. I left camp on Saturday with a full heart and the all too familiar feeling collectively known as PCD—post camp depression. For approximately the next three weeks, I will be bombarding my innocent friends from home with stories about camp, singing random lines from songs about muffs and crazy elephants, and talking like a Madison Mustang (feel free to ask for a demo—it’s worth it). While the aftermath of camp is pretty tough, it just makes me more excited for next year. In the end my week at camp reaffirmed what I’ve known for 8 years: my heart belongs to One Step at a Time. Previous PostAn Inspiring WeekendNext PostI’M GOING TO WORLDS! I am smiling and crying. Thanks for sharing about this amazing place and experience. You inspire many, including me.